A hamster's moods aren't particularly complicated, and neither are his reactions. Despite his tiny body, your hamster's body language usually speaks loudly and clearly, telling you whenever he is happy, frightened or angry. When you can identify that your hamster is angry, you can figure out whatever he needs and give it to him, so that he no longer has to deal with the frustration of trying to communicate his wants and needs. Hamsters are small but vocal creatures, and if yours is angry about something, he'll let you know. Hissing and squeaking are the extent of his vocabulary, but they say it all: he's agitated. While squeaking is also typical of a frightened or nervous hamster, hissing is an unmistakable sign of anger. Pay attention to his body language when he hisses—if he is crouched, baring his teeth and raising his front paws, he's definitely an unhappy camper. While hamsters may have several reasons for biting the bars of their cages, anger is one of them. He may bite the bars as a way of working out aggression or simply demonstrating his displeasure. Other reasons for biting the bars include behavioral and biological ones. For example, he may be chewing the bars as a way of making noise and getting your attention—since they're nocturnal animals, he may especially do this when you're trying to get some sleep. He could also be doing it to dull his continually growing teeth—giving him a hard chew toy solves that problem. While it may seem obvious, if your hamster bites you, it's often a sign of anger. Of course, it could also be a sign that your hands smell good—if you didn't wash them between eating a sandwich and picking up your hamster, he's probably going to nip at you. If he is biting your hands and acting restlessly, though, he's either angry or frightened, and wants to be put down. You may need to slow down your hand-taming lessons until he feels more comfortable with being handled. To prevent your hamster from becoming frustrated and angry, just give him what he needs. 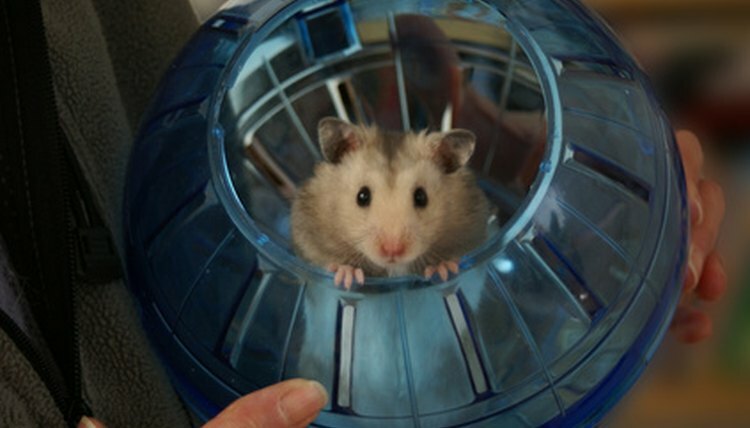 For example, if he hisses and squeaks constantly, give him something to do in his cage: a wheel for running on may divert him and improve his mood. If he bites at the bars of his cage all the time, take him out for some personal attention. Keep him on a consistent schedule, as an unpredictable lifestyle can agitate him—everything from his feeding schedule to the lighting and room temperature should be as predictable as possible. Can Sugar Gliders Make Wheezing Sounds? What Does Is Mean When Rabbits Stomp Their Back Leg?